Even when Nashi flagrantly breaks the law, the authorities do not intervene. After Estonia enraged Russia by moving a Soviet-era war memorial in April, Nashi led the blockade of Estonia's Moscow embassy. It daubed the building with graffiti, blasted it with Stalin-era military music, ripped down the Estonian flag and attacked a visiting ambassador's car. The Moscow police, who normally stamp ruthlessly on public protest, stood by. Just as the Nazis in 1930s rewrote Germany's history, the Putin Kremlin is rewriting Russia's. It has rehabilitated Stalin, the greatest mass-murderer of the 20th century. And it is demonising Boris Yeltsin, Russia's first democratically-elected president. That he destroyed totalitarianism is ignored. Instead, he is denounced for his "weak" pro-Western policies. Franklin D Roosevelt and Harry Truman may have failed to realise that nuclear weapons would one day endanger humanity's survival. But, unlike Stalin, they were not genocidal maniacs. If tens of thousands of uniformed German youngsters were marching across Germany in support of an authoritarian Führer, baiting foreigners and praising Hitler, alarm bells would be jangling all across Europe. So why aren't they ringing about Nashi? IF YOU believe in realpolitik, it is a no-brainer. Kazakhstan should chair the Organisation for Security and Co-operation in Europe (OSCE) in 2009. If you believe in the principles of democracy on which the OSCE was founded, the question of Kazakhstan is a no-brainer too: an undemocratic country should not chair one of the continent’s main democracy-promoting organisation. This is no mere wrangle about protocol. The debate over Kazakhstan and the OSCE raises a fundamental question about Europe’s willingness to trade democracy for security. The OSCE was founded on that bargain—but the other way round. The then Conference on Security and Co-operation in Europe, meeting in Helsinki in 1975, traded security, in the form of Western assent to the division of Europe, for freedom: the Kremlin’s formal commitment to support human rights across the continent. That helped destroy totalitarianism, because it gave dissidents behind the iron curtain a legal basis to challenge their communist rulers. Now Russia and its allies want to cripple the OSCE until it turns into a mere talking-shop. They have systematically tried to strangle its election-monitoring outfit, the Warsaw-based Office for Democratic Institutions and Human Rights (ODIHR—pronounced, aptly enough, “oh dear”). The Kremlin also detests the OSCE’s openness to independent non-governmental organisations. The OSCE is one of the few places where outfits such as the Russian-Chechen Friendship Society (banned in Russia but now registered in Finland) can get a public hearing before an official audience. The chairmanship of the 56-member OSCE changes every year. Spain holds the chair now; Finland is next. Kazakhstan desperately desires the job in 2009. Giving Kazakhstan what it wants, argue supporters such as Germany, would help reach out to the most important and promising country in central Asia. It would integrate Kazakhstan into the heart of Europe’s security structures—and maybe gain Kazakh support for a gas pipeline direct from central Asia to Europe, bypassing Russia. Perhaps. But it is hard to portray this as a move to counter Russian influence in central Asia, given that the Kremlin also strongly supports the Kazakh bid. Russia wants to set a precedent that a non-democratic country can hold the chair. This year Kazakhstan, so why not Belarus in 2010? Britain and America are still holding out against the plan. Kazakhstan’s human-rights record is dire. It has never held an internationally validated election. 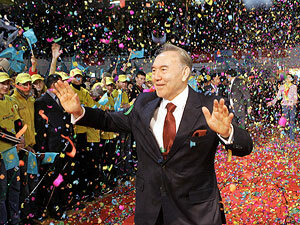 Nursultan Nazarbayev (pictured), the president for 17 years already, has just claimed the post for life. Leaders in Washington and London fear that Kazakhstan may mute the OSCE’s effectiveness if, say, an election is rigged, a demonstration violently crushed or a journalist killed somewhere in Russia or another part of the former Soviet Union in 2009; judging from current affairs, such events are all too likely. Certainly the evidence so far is that stretching democratic principles to accommodate undemocratic countries does not spread freedom, but merely dents those principles. Admitting Russia to the Council of Europe, another talking-shop with a grand human-rights mandate, now looks premature to say the least. The same applies to the G8, supposedly a grouping of big advanced democracies. Official harassment of pro-democracy protesters made Russia’s G8 summit in St Petersburg last year a shameful farce. One solution would be to say that Kazakhstan can be chair in 2011—but only if it first meets some elementary democratic criteria. But it may be too late for such a deal. Anything short of the chairmanship in 2009 will be seen as a severe snub. The sad truth is that an organisation like the OSCE can function only if its members mostly agree on most principles. That was the case through the 1990s. It no longer holds now. Rather than make shameful compromises in the name of security, it would be better to concentrate on the best long-term bet: promoting freedom. Plenty of people have wanted to kill Boris Berezovsky. Personally, I wanted to strangle him. In the chaotic Russia of the 1990s, he was the epitome of the 'oligarchs': the profiteers from a no-holds-barred capitalism that had created a handful of billionaires while leaving millions of Russians destitute. But even by Russia's demanding standards of unpunctuality and indiscipline, he was chaotic. His office habitually denied all knowledge of his whereabouts. His mobile phone numbers - he had several - changed constantly. With luck, you would reach a bodyguard, who would take a note with your name into the tycoon's presence. Berezovsky would either shake his head wordlessly, or - if you were very lucky - take the phone, offering anything between a minute and an hour; or the promise of a meeting; sometimes it would even happen. His favourite meeting place was what he called his "club" (though it seemed to have only one member). This was a lavishly-restored and closely-guarded Tsarist-era mansion where he liked to show off the exquisite materials and workmanship. The sources of Mr Berezovsky's money have never been entirely clear. Which explains, at least in part, why he is no longer a man of huge economic and political influence in his native land, but is living in exile in England, in permanent and justifiable fear of his life, travelling everywhere in one of his two armoured Maybach limousines (£400,000 each) and watched over by his protection team of former French Foreign Legionnaires. Berezovsky likes to parade himself as a political dissident whose outspoken criticisms of President Putin's regime make him a true friend of democracy. That is not quite the full picture. To understand the man and his motivations we need to travel back into his past, to a time when millions of Russians were trying their luck at business in the collapsing years of the Soviet Union. Mr Berezovsky - a gifted mathematician - started as a dealer in cars, buying Ladas straight off the production line "for export" at a very favourable price and then selling them (without any export having taken place) at a profit. How he managed to persuade the management of that run-down wreck of a factory to part with valuable stock at such a bargain price remains a mystery. That business financed other ventures. Next came a scheme selling bargain-priced shares in a planned car factory. It was never built; nobody got a car and the scheme collapsed, wiping out participants' savings. Mr Berezovsky insists that the scheme was honestly run, and its collapse was not his fault. He next moved into the media business, taking effective control of the main television channel, ORT, and purchasing a clutch of heavyweight newspapers. He also gained control of an oil company and became an influential force in the Russian national airline, Aeroflot, setting up a Swiss-based company to handle - and critics say to siphon off - its foreign-currency revenues. As his business empire expanded, so his political influence soared. His office in the "White House", the seat of Russian government, adjoined that of the then prime minister, Viktor Chernomyrdin. He was supremely well-connected in the Kremlin too, where an increasingly drunken and frail President Boris Yeltsin had given free rein to his daughter, Tatyana, and her husband. As the Yeltsin family cast around for a successor who would keep them out of jail, it was Mr Berezovsky who pushed the case of a quiet, ex-KGB-man-turned bureaucrat, called Vladimir Putin. He was unashamed about his abilities to turn power into wealth and vice versa. Although he insisted that he wanted Russia to become a modern democracy, it was hard to see his practical contribution-to this and outsiders who did business-with him were less impressed. In 1999, at Moscow's leading investment conference, I watched Mr Berezovsky facing unaccustomed scrutiny from a western fund manager. "Can you name any company you have been involved with where the cash flow has not been siphoned off and the other investors defrauded?" asked the irate banker. "Come on, sir, just name one." Such fury had long been shared by the vast majority of Russians. In their eyes, Berezovsky symbolised the looting and influence-peddling that had so marred the Yeltsin era. As such, he had many enemies. A car bomb in 1994 nearly killed him. And when Mr Putin began bringing a semblance of order to Russian politics after becoming president in 2000, Mr Berezovsky was an obvious target. Berezovsky had made the fatal mistake of assuming that Mr Putin would be a weak president, who would not dare challenge the business empire of a fromer poitical ally. He was wrong. In the summer of 2000, when Mr Putin first unleashed the prosecutor's office on him, Mr Berezovsky responded toughly, claiming that dictatorship was looming. Few sympathised with him. In a few months, he had lost his most important assets. His television channel, ORT, was back in government control. Prosecutors and accountants were poring over the books at Aeroflot. So Mr Berezovsky moved to London - taking up a promise made by the British government in 1998 when he brokered the release of two British hostages in Chechnya. For all the luxury of his Mayfair offices and Surrey mansion, it is unlikely that Mr Berezovsky planned a long stay. But like many Russian emigres in past centuries who kept suitcase packed for their imminent return home, it has been much postponed. Mr Berezovsky's frequent entreaties against the Kremlin have come to nothing. Opposition parties shun his advances. His associates were mostly fringe figures such as Alexander Litvinenko, a renegade officer of the Russian security service, whose escape from Russia was facilitated by Mr Berezovsky. As the world now knows, Mr Litvinenko was subsequently murdered after his cup of tea was poisoned with radioactive polonium in a London hotel, triggering the current diplomatic stand-off between Britain and Russia. If, as some suspect, this assassination was meant to send a warning signal to Mr Berezovsky to halt his political rabble-rousing against the Kremlin, then it has had precisely the opposite effect. His pronouncements have become increasingly shrill. He told a British newspaper that he wanted to remove Russia's rulers "by force" - infuriating the British government. At a recent debate at London's Frontline club, Mr Berezovsky kept Russia-watchers, journalists, spooks and fellow-emigres transfixed with his demolition of his native country's lethal fusion of business and political power, enforced by secret police tactics. But a sardonic intervention from the audience left him - for once - speechless. "You have well described the monster that runs Russia. But it is one that you yourself created." Mr Berezovsky's analysis may indeed be hypocritical, but it is still largely correct. And while he may be a difficult man to admire, if the Russian authorities have indeed tried to kill him, there could be little more convincing proof of the terrifying contempt in which the Kremlin holds our way of life. Edward Lucas is author of a forthcoming book The New Cold War And How To Win It. WHEN people like this complain, you take notice. Vladimir Bukovsky spent 12 years in Soviet prison camps before being deported in 1976. Oleg Gordievsky was Britain’s top defector from the KGB. Both are British citizens. So was their friend, Alexander Litvinenko. They and other cold-war veterans have written a letter this month expressing their alarm at the BBC Russian service’s coverage of Litvinenko’s murder. The victim, speaking from his deathbed in November, blamed the Kremlin for his radiation poisoning. Russia, of course, insists that the murder was staged by its enemies (chiefly Boris Berezovsky, an exiled billionaire businessman and arch-critic of the Kremlin). The BBC management is right to be careful when covering sensitive stories. Russia regards Mr Berezovsky as a criminal. It also wants Britain to extradite Ahmed Zakayev, another exile, who represents the remnants of the elected pre-war Chechen government. Russia insists he is a terrorist (though the soft-spoken actor has always denounced terrorist outrages perpetrated in the name of his cause). But caution is one thing. Pusillanimity is another. The Russian service’s coverage of the Litvinenko story, the complaint goes, largely ignored Messrs Bukovsky, Gordievsky, and Zakayev. That seems odd. They all knew Litvinenko well. They have made powerful arguments about his death, what it says about the Kremlin under Vladimir Putin, and how Britain should react. One programme from the Russian service did use extensive clips of all three men. But it was repeated only once (normally it would have gone out around five times); it disappeared from the website after only two days, instead of the normal week. The producer, apparently, received a severe reprimand. The BBC contests the complaint vigorously. It makes some reasonable points: it was to the BBC Russian service that Mr Litvinenko gave his last broadcast interview. Mr Zakayev also appeared in another programme. The signatories of the letter were interviewed, then and at other times. Yet there is a paradox: the interviews about the Litvinenko case that the BBC cites in its defence were for the very programme it is now disowning. People who heard it say that it was punchy, and certainly gave a lot of space to the Kremlin’s critics (though it put the countervailing view as well). By the standards of the domestic BBC, that would be nothing unusual. But perhaps not by the standards of the Russian service, whose editors—at least in the view of many hawkish British-based listeners—have lately been erring on the side of caution. Annoyingly, the BBC declines to make a copy of the banned programme available so it is hard to judge whether its punchiness outweighed professional balance. To those who worry that the Kremlin’s tentacles already reach dangerously far into Western institutions, the story has a dismal ring to it. They think the BBC’s twitchiness reflects its desire to hang on to its use of transmitters inside Russia. Several of these have already been cancelled by Russian authorities (though the difficulties predate the Litvinenko affair). Following Britain’s expulsion this week of four Russian diplomats, to protest against the Kremlin’s refusal to extradite the main suspect in the Litvinenko murder, the remaining frequencies may be at risk too. But what is the point of having broadcasts if you cannot broadcast freely? Russians have plenty of tame radio stations to listen to. In the dark days of the cold war (when people like Mr Gordievsky were risking their lives for Britain) the BBC Russian service was both fair and incisive, a splendid contrast to the Soviet block’s propaganda stations. It would be disastrous if the service was now soft-pedalling its criticism of the Kremlin. The BBC bosses are energetically countering their critics, but seem untroubled that they have lost their confidence in the first place. How they must be trembling in the Kremlin. Britain is talking tough: a "withdrawal of cooperation" in education, social affairs or trade. Probably the first public expulsion of Russian diplomats since 1996. Officials will dress this up as a strong response. But in truth it is preposterously feeble. We have seen nuclear terrorism on the streets of London. The assassins used polonium-210, a rare radioactive isotope produced in a Russian government research institute. They killed a UK citizen and endangered dozens more. Now Russia is brazenly refusing to extradite the prime suspect. It is clear that Britain now officially accepts what many have been saying for months: that the FSB, the secret-police heirs to the KGB, connived in the murder of Alexander Litvinenko. If the skull and crossbones were flying over the Kremlin, it could hardly be clearer: Russia under Vladimir Putin is a pirate state that unashamedly flaunts its contempt for the law. It is no exaggeration to say that the FSB runs Russia: its former chief, Mr Putin, is the president. Its ruthless and greedy tentacles stretch across all corners of that vast land, high finance to the depths of organised crime. It has throttled Russian democracy. It is gobbling up business. Now it is hunting down the Kremlin's foes abroad. We should be responding to this outrage with a series of tough measures that will hit the Kremlin and its cronies hard. Britain's first step should be the expulsion of not just a symbolic few, but every one of the dozens of FSB operatives here. They range from a handful who are "declared", working openly at Russia's embassy and Edinburgh consulate as liaison with British counterparts. The more sinister ones pretend to be cooks and drivers there. At the Aeroflot check-in back to Moscow they can meet their deep-cover colleagues: those pretending to be businessmen and students. Some expulsions may, indeed, have already happened. Sources say they were kept quiet in order not to escalate the row with Russia. If so, that was typical official spinelessness: we should be trumpeting our fury from the rooftops of Whitehall, not sparing the Kremlin's blushes. We should stop giving Russia's rulers visas to come here. They enjoy the spoils of power at home while they invest in Britain, their wives shop here, and their children go to our finest private schools. They must realise that welcome is cancelled for accomplices in murder. British banks and businesses must realise the risks of gobbling Russian bait. The heads of Britain's biggest companies recently paid grotesque homage to Mr Putin at an economic forum in St Petersburg in June. They included BP and Shell, seemingly undeterred by having had their best assets in Russia snatched by the Kremlin's business allies. Tony Blair had just warned British firms about the political risks of Russia. Yet scandalously, our captains of industry toed the Kremlin line, that Mr Blair's warning was the "emotional outburst of an ex-prime minister". Not since British trades unionists went to the Kremlin in the 1980s to praise the peace-loving Soviet leadership and denounce the "war-mongers" Thatcher and Reagan have I felt more ashamed. The bleak truth is that we again have a fifth column in this country. During the last Cold War it was the communist trade unionists, who with their "peace movement" allies used the Kremlin's secret funding to undermine our democracy and our defences. Now the fifth column wear pinstripes, not overalls. The 30 silver roubles that fuels their treachery is not smuggled, but highlighted in the top line of their annual report and accounts. No compromises: Vladimir Putin police. Yet Russian companies that have looted their rivals and defrauded their shareholders are allowed to raise money on the London Stock Exchange. Our American allies now deny visas to dodgy tycoons and have toughened the rules for Russian companies wanting to list their shares in New York. But London's financial markets have become a colossal car boot sale for the crony capitalists of the Kremlin. The grim pattern is repeated across Europe. Our influence on Russia is swamped by the Kremlin's clout inside the West. 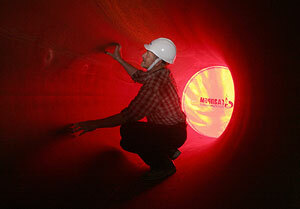 Its energy companies' investments create a formidable bridgehead. Germany's gutsy Chancellor, Angela Merkel, longs to be tough with Mr Putin, a man she loathes. But her own party's influential business backers are holding her back. We must stop Gazprom and other statebacked Russian energy companies buying our companies until Russia abides by the rule of law. That day is a long way off. Russia's increasingly menacing nuclear posturing gives the lie to any idea that a replacement for Trident is no longer necessary. We need to upgrade our electronic security: the cyber-assault on Estonia in May was a grim warning of what awaits those who annoy the Kremlin. Networks of thousands of computers - known as "botnets" - hijacked by organised criminals crashed many of that brave little country's most crucial websites, cutting off the outside world. American and Nato specialists have been working intensively to learn the lessons of that attack. We risk being dangerously complacent. The BBC must urgently investigate the scandalous pusillanimity of the Russian service, once an emblem of British liberty and now unwilling to interview Cold War heroes such as Oleg Gordievsky on the Litvinenko case for fear of losing their transmitters in Russia. It is worrying that Gordon Brown's close advisers include no one with real knowledge of Russia, now the world's largest rogue state. Britain has the chance to lead Europe in resolute resistance to the Kremlin's xenophobic and authoritarian regime. Let us hope our new prime minister does not flinch from the challenge. OUTSIDERS often mock Poland's prickly, obstinate prime minister, Jaroslaw Kaczynski. But a collapse of his government, followed by months of instability, might be worse. An anti-corruption watchdog this week named a deputy prime minister, the temperamental farmers' leader Andrzej Lepper, in a bribery scandal. Mr Kaczynski promptly sacked him (for the second time). Mr Lepper, who denies any wrongdoing, threatened to take his party, Self-Defence, out of the coalition. That would have meant minority rule and perhaps an early election, bogging down Poland's haphazard reforms completely. The European Union's most unpredictable member would be even harder to handle. But Self-Defence does not want an election campaign in which its already pungent reputation for cronyism might take centre stage. Fearing a revolt, Mr Lepper apparently backed down, suggesting his party may stay in the coalition “conditionally”. Mr Kaczynski's Law and Justice Party may also want to defuse a row with its hardline Catholic supporters before facing voters. Father Tadeusz Rydzyk, who runs a highly politicised media empire, recently called Mr Kaczynski's sister-in-law a “witch” who deserved “euthanasia” because of her support for abortion. That prompted a rebuke from her husband, Lech Kaczynski, Jaroslaw's twin brother and Poland's president. Law and Justice's embrace has proved near-fatal to the other coalition party, the nationalist League of Polish Families. It may now do the same for Self-Defence. Mr Kaczynski can thus safely go for an early election whenever he chooses. But his canny politicking is not matched by ability to govern. Attempts at health reform, for example, have brought doctors at more than 200 hospitals out on strike. Nurses demanding higher wages are camping in tents outside Mr Kaczynski's office. They say he has broken election pledges to help losers from the post-1989 transition, such as ill-paid public-sector workers. The government has also failed to reform public finances, essential if Poland is to follow Cyprus and Malta into the euro (see article). Its main boasts are reforms in the intelligence services, stronger anti-corruption efforts and weeding out communist-era secret-police collaborators. These may have been worthwhile, but the government's approach has been highly partisan, even vengeful. Public administration is lamentably backward. As the political system fails to reflect Poles' exasperation with their poor quality of life, many are voting with their feet. Some 2m have gone abroad since Poland joined the EU, and a recent survey found another 3m planning to do the same. This is aggravating labour shortages that may undermine the country's competitiveness. Poland's foreign policy is also being mismanaged. 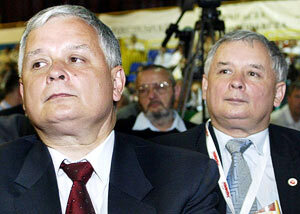 At the recent EU summit, Mr Kaczynski won a delay on new voting rules that will reduce Poland's weight. But the victory was marred by his graceless approach, using Poland's wartime suffering at German hands as a bargaining chip. It was Germany that pushed hardest for Poland's EU entry. Now German diplomats in Warsaw say relations cannot improve so long as the Kaczynskis are in power. On the foreign front, things may get worse still. Law and Justice has just suspended its most sensible foreign-affairs expert, Pawel Zalewski. A deputy leader of the party, he dared to quiz the lightweight foreign minister, Anna Fotyga, at a parliamentary hearing. The disconnection between Poland and its EU partners was underlined when a Polish candidate to run the IMF was brushed aside. Both Poland and the EU would like to see a strong, dependable government in Warsaw. It may be some time before they get one. Europe’s only chance of getting gas along pipelines that Russia doesn’t control is a project called Nabucco. Its aim is to connect the gas riches of the Caspian and the Middle East to Europe via the Caucasus and Turkey. But Nabucco’s chances, never strong, are looking flimsier by the week. First, there doesn’t seem to be much gas to pump. It can’t come from Iran while the country wants to wipe Israel off the map. It can’t come from Iraq, for reasons too painful to mention in polite Euro-Atlantic company. None of the other Arab pipelines exists as more than a line on a map. Azerbaijan is willing to send gas, but doesn’t have very much. And the gas in Kazakhstan and Turkmenistan is off-limits. Leaders there, understandably, show no sign of wanting to annoy the Kremlin just to help an indecisive, stingy and unfocussed Europe. Worse, it is not clear that the countries the pipeline would pass through are interested. Turkey, having been snubbed by the European Union, has developed an alarmingly close relationship with Russia, particularly in the energy sector. That has already led to the building of Blue Stream, a pipeline across the Black Sea of astonishing technical merits and questionable economic ones. Only a fraction of its capacity is used. Now Russia wants to build another gas pipeline across the Black Sea, this time to the Balkans. That would completely kybosh Nabucco’s chances. Once one pipeline exists, it doesn’t make sense to build another one. But is that the clink of spurs from over the hill? Two men are riding to Europe’s rescue. One is Andris Piebalgs, the EU energy commissioner. He is tall and soft-spoken. His American counterpart and ally, Matt Bryza, is tall too. But he throws rocks. At a recent conference on energy security in Riga, much of the proceedings were a bit soporific: prepared statements read in heavy accents, with accompanying PowerPoint slides. But Mr Bryza was a showstopper. When a Russian representative promoted the Baltic gas pipeline on ecological grounds, Mr Bryza intervened forcefully, pointing out that in the Caspian, Russia is arguing that undersea gas pipelines are dangerous. Both men insist that Europe’s predicament is not as bad as it seems. The thinking goes broadly like this: Turkey has no desire to be dependent on Russia for all its gas. So despite Europe’s sticks, and Russia’s carrots, Ankara will probably support anything that diversifies its gas supplies. Second, Azerbaijan has enough gas to get Nabucco going, if not to make it pay its way in the long term. And by the time the gasline is built, who knows, Iran may be back in the civilised world. Third, someone has given the Hungarian government a stiff talking to and the prime minister, Ferenc Gyurcsany, will give a speech at a conference in September strongly endorsing Nabucco. It is uplifting stuff. But the striking oddity is that just as in the last cold war, Europe’s security still depends so much on the Americans. Mr Bryza is taking on Russia’s energy monolith in single-handed mortal combat, because faraway America sees Europe’s problems with proper clarity. And then as now, most European governments are childishly unfocussed—and ungrateful. IMAGINE some souped-up old bangers driven confidently but not expertly on a smooth road in fine weather. That is the economic picture of the ten east European countries that are now in the European Union. If the road gets wet or slippery, bad brakes and bald tyres make a crash, even a pile-up, horribly likely. The country that most troubles outsiders is Latvia. It has a whopping current-account deficit: some 21% of GDP in 2006, and bigger still so far this year. That reflects soaring consumption and household debt, financed mainly by foreign-owned banks. Wages are rocketing—up by a third year-on-year. Inflation is over 8%. This points to a need for tough restraining measures. But the currency, the lats, is pegged to the euro, so the central bank's ability to raise interest rates is constrained. Although the IMF issued a sharp warning in May about the need for a fiscal squeeze, the government is keener on harvesting the dividends of double-digit GDP growth than on acting to avert the risk of a crash. Aware of the dangers, the banks, mainly Swedish-owned, are reining in lending. Their share prices wobbled during a brief financial crisis in February. Prudent behaviour by the banks may amount to a monetary tightening on its own. Other modest measures include making tax declarations a mandatory part of loan applications, deterring those with undeclared wealth. A speculative attack on the lats may tempt some, but it is tricky to organise in Latvia's puny financial markets. Latvia is a financial pipsqueak, with only 0.2% of the euro area's GDP. If it does run off the road—for example, if it is forced to unpeg its currency—the main victims will be local borrowers and foreigners who have lent to them (in theory, but probably not in practice, Western banks could refuse to bail out local subsidiaries, even if their loan books shrivelled). 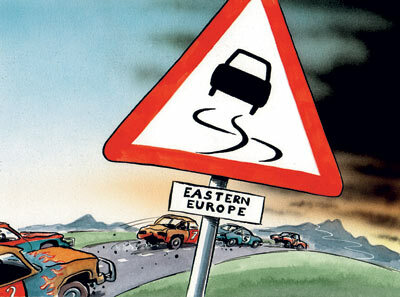 Any crash in the Baltics is unlikely to affect outsiders' views of other regional economies. The likeliest route for contagion would be to next-door Estonia. It is also overheating, but its somewhat more responsible government has a modest budget surplus. The other early candidate for a crash has long been Hungary, which admitted last year that it had been running a budget deficit of 10% of GDP. But a combination of tax rises and modest spending cuts has trimmed the deficit. Exports and industrial production have risen. The central bank has begun to cut interest rates. Hungary has been “disgustingly lucky”, says Juliet Sampson of HSBC, a bank. Even if a pile-up is avoided, overheating is still undesirable. As euro members like Portugal have found, a boom stoked by low interest rates and a fixed exchange rate can lead to a long period of uncompetitiveness and slow growth. Except for Slovenia, which is now in, none of the east European countries is likely to join the euro for some time—but they have mostly been able to borrow as cheaply as if they were already members. So how to cool things down? For countries that can do it, keeping their interest rates above the euro's and letting their currencies appreciate helps. So does bringing in foreign workers from places such as Ukraine in order to reduce upward wage pressures. Slovakia is a prime example of how to pull off both tricks. The only long-term answer is not to add coolant or to drive more slowly, but to fix up the car. Unfortunately the process of structural reform in the region has largely stopped. Fast growth in tax revenues plus weak political leadership makes for less pressure to get a grip on public finances. Poland and Romania, in particular, have proved alarmingly ready to make expensive spending pledges for political reasons. A new World Bank study of public spending (see chart below) highlights the bad bargain that the region's taxpayers are getting. Almost everywhere, public spending is higher than it should be for middle-income developing economies. In Albania, the study finds that overstaffing, poor debt collection and wasteful management at the state-run water industry alone costs 1% of GDP. Despite the spread of flat taxes, the “tax wedge”, which includes social-security and other charges, can be as much as 40% of wages. Changing this is a political matter, not an economic one. But the evidence is that voters do not much like reform. Reforming governments have usually lost the next elections. A report from the European Bank for Reconstruction and Development shows that, in most of the region, only minorities of voters, and sometimes not even a plurality, support both a democracy and a market economy (many choose the “don't care” option instead). Nor is there any obvious punishment for a failure to reform. Romania and Bulgaria have been backsliding ever since they joined the EU in January, and yet there have been only mild complaints from Brussels, which has lost the leverage that it had before the two countries' entry. Capital markets are accommodating too. The lesson that other countries take from Hungary's financial shenanigans is that it is possible to spend like crazy to win an election and then sober up afterwards. That will change when global conditions make growth a hard scrabble, rather than a bonanza, and borrowing money means dealing with flinty-eyed sceptics, not rosy-eyed thrill-seekers. The politicians may then have to concentrate on the real sources of competitiveness: brains, hard work and clean government. YOUR family is kidnapped by a cult that murders your best and brightest, steals your money and tries to brainwash your children. Eventually, it collapses and you are free—if a bit batty and scruffy after years of captivity. Your relatives have lived well in the meantime. You expect warmth, sympathy and generosity. But they sneer at your backward habits and treat you as an outsider. If you want to join the family (or rejoin, as you see it) you will have to fit in. And you had better be humble and grateful. That, roughly, is the source of the misunderstanding between Poland and the old democracies of Europe. Lech and Jaroslaw Kaczynski, the twins who are the country’s president and prime minister, are outraged that the European Union is treating Poland as a new member of a club. Of course Poland won’t meet all the EU’s standards (and, the Kaczynskis note, many old members break them too). But does not western Europe owe it a huge moral debt? The twins almost brought a recent EU summit to a standstill by insisting that a new treaty give smaller countries greater voting rights, rather than have such rights determined directly by population size. The treaty favoured by western European countries would have given Germany the most votes—a fact that sat poorly with another singular but deeply held belief in Poland: that Germany must still atone for the second world war. Germany’s notorious closeness to Vladimir Putin’s Russia under Gerhard Schröder, chancellor from 1998 to 2005, added insult to injury. First Germany murders millions of Poles. Then (telescoping history a bit) it tries to short-change Poland on EU voting rights. Even worse: when Poland tries to negotiate toughly (just as other EU members do) it is patronised and abused for being “prickly” and “obstinate”. That, Poland insists, verges on the racist. It is hard not to sympathise with the Poles on some points. Western Europe has indeed been grudging, timid and hypocritical in its dealings with the former captive nations. The first reaction to the collapse of communism was to erect trade and visa barriers, not to welcome the kidnapped victims into the common European home. But as with so many things, the Kaczynskis’ views are frozen in the past, and their logic is based on misunderstandings. To say “something very negative is happening in Germany”, as Jaroslaw Kaczynski did in a recent radio interview, is monstrous. It would have sounded mad and silly even when Mr Schröder was in charge. Angela Merkel, the present chancellor, is tremendous: the best-placed friend that east Europeans could wish for. It is most likely the only time that someone who grew up under communism will run one of the big Western democracies. It is true that Germany’s politics are still too Russia-centred. But Mrs Merkel is struggling to unpick that, quite successfully. Poland could help her by offering friendship. The deal is blindingly obvious. Poland’s leaders could say, “we will support you inside the EU, to make it easier for you to support us against Russia”. Instead, the Kaczynskis prefer to wallow in a swamp of paranoid nostalgia, in which Germany and Russia are enemies of an equal hue. Obviously, hard bargaining is sometimes necessary: even the best friends in the EU haggle like mad. But wise negotiators can talk nicely too. After the bruising EU summit in June, Poland could have been gracious in victory—they succeeded in delaying the new voting system’s implementation for a decade—but instead the Kaczynskis were grudging and ungrateful. Ireland’s diplomats are renowned for getting what they want. But their logic and persistence are laced with charm. They do not try to wrongfoot their British counterparts by suddenly raising historical atrocities. They stick to deals. The Kaczynskis have won a battle. But they risk making Poland as Greece used to be: unpopular, expensive and, most dangerously, marginal. Perhaps only America can persuade the avowedly Atlanticist twins that a strong Poland in a strong EU is hugely preferable to a marginalised Poland in a weak one.